Ask for protection in Allah, from Shaytan, the one who has been thrown out! Allah tells us about Shaytan in the Qur’an. His name was Azazeel and he was also known as Iblis. He used to pray a lot and was known by all the angels in Heaven. When Allah made the ﬁrst man, Prophet Adam (as), He asked the angels including Azazeel to do sajda to Adam (as). Iblis refused. He was proud and thought because he was made of ﬁre, it made him better than Adam (as) who had been created from mud. Iblis did not listen and do what Allah said, He did not obey Allah. Iblis wanted to worship Allah as he wanted and not as Allah wanted! Allah ordered him out of Heaven. Allah no longer called him Iblis but Shaytan, the one who is far away. Shaytan’s disobedience kept him far away from Allah. He bacame rajeem, thrown out and away from Allah's love and kindness. Shaytan became very angry. He said he would do whatever he can to take people away from Allah. Allah told him that he would not have power over the people who believe in Allah. They would never follow and listen to Shaytan. Allah warns us in the Qur’an about Shaytan and tells us that he is our enemy. Shaytan is always busy making plans on how to make you listen to him and not to Allah. He whispers bad thoughts into your heart and mind and tries to stops you from doing good deeds. The name Shaytan, tells you that he is someone far away from Allah. It reminds you that Shaytan's job is to take you far away from Allah too! But Allah is the Most Powerful and the Best Protector. If you remember Allah and ask for His help, then Shaytan can never win! The Power of Allah over Shaytan is greater than the power of Shaytan over you! One of the specific times, Allah has taught us to say ‘Audhubillah’, is when we recite the Quran. Why do you think this could be? Everytime we say ‘Audhubillah’, we are asking Allah to protect us from Shaytan so that he doesn’t make us do things which would take us far away from Allah. We do not want to be thrown out and away from Allah's love and kindness like he was! Stay in wudhu as Shaytan is made of ﬁre and water is a way of cooling ﬁre down! If you can't do wudhu, recite Audhubillah over water and splash it on your face or on water before you drink it. Label up a small travel bottle of water with the phrase and remind children to use it when they feel angry or distracted to do what is wrong. One child holds a large cut out heart while the child on the rights 'whispers' aloud to him a wrong action to do. The child holding the heart shakes his head and says loudly 'audhubillah'. The heart is then passed on around the circle, while the neighbouring child tells him a 'bad whisper'. 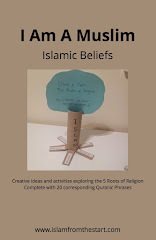 Learn the key concepts and vocabulary of the surah through signing and a fun experiment.